For some families with several children, the yearly school lunch bill can add up to $1,000 a year, so many qualifying schools in the valley have elected to participate in a program that provides free meals for all students. “It’s a huge savings for working families,” said Mission Superintendent Jason Sargent. This is the first year that Mission elementary school and middle school students are participating in a national breakfast and lunch program called Community Eligibility Provision. Many other schools are working on a second year with the program including Ronan Middle School, K. William Harvey Elementary School, Pablo Elementary School and Arlee Elementary School. Students need to eat school lunch for the program to work. First, a school purchases the food so that both breakfast and lunch are available for each child. The school is then reimbursed for each meal that was eaten by a child. If there are leftovers, the school doesn’t get reimbursed. “The gamble with this program is that we can lose money if kids don’t eat,” Sargent said. Schools can receive reimbursement for meals if a high percentage of students qualified for free lunch in the year prior to implementing the program. Area high schools didn’t qualify for the program, which is typical. Sargent explained that older students are allowed to go off campus for lunch and many don’t sign up to receive free or reduced lunch. “The campus is closed for younger students, so they bring a lunch or eat a hot lunch,” he said. Mission qualified for the program last year, but they decided not to participate due to the possibility that the students might not all choose to eat a lunch prepared at the school. The kitchen staff creates a menu that meets state guidelines. “We have to have a certain amount of fruit, vegetables, protein and grains,” Mission Food Service Director Karen Belluomini said. And they also want to make something the kids will eat. “We are going to let the kids pick one of their favorite school meals for Thursdays,” she said. It wasn’t hard to imagine what a few 8-year-olds might pick for their favorite meal as they ate lunch on Thursday afternoon from trays divided into sections with a slice of whole wheat pizza, carrots, grape tomatoes, bananas and a bread stick with sauce. 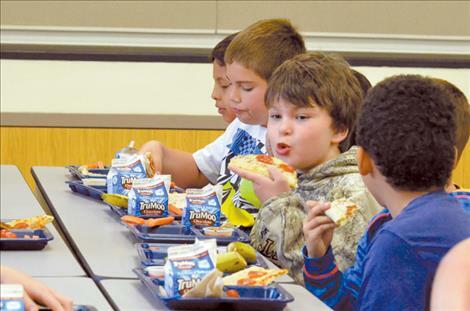 Arlee Superintendent Dave Whitesell said the program has worked well in his district, and he plans to continue implementing ways to ensure that students get the nutrition they need.